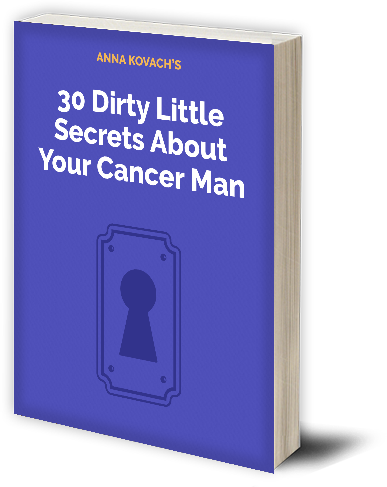 Cancer Man in Love Will Make You Feel Special - "Weak in the Knees"
What is the Cancer man really like when he’s dating? What is the Cancer man in love look like? Keep reading and I’ll explain to you as best as I can how wonderful a Cancer man really can be when he’s in love. This title means that he’s a romantic and he’s about spending time with someone who means a whole lot to him. When you find that a Cancer man is in love with you, he’s going to want to spend more time with you. He’s going to want you to come to his place, go to your place, take you out, or just find some way that he can be close to you thus get to know you so much more. He will be very romantic with his words, his actions, and his feelings. Cancer man is typically a very nice guy to just about everyone. He does this to a point where other people are actually confused as to whether he’s being nice or if he’s into them. Some people think he’s flirting when he’s not. However, when he’s flirting heavily with you and asking you to spend more time with him, he’s not just being friendly. He’s likely falling in love with you and wants to make sure that all his free time is being with you. He’s one that wants to take up all your free time. He may not understand it if you want to have alone time without him. He’ll do his best to get it but he will want you to be around him as often as possible. When he’s with you, he’s going to take good care of you. You’re his queen after all. He will spoil you with feeding you, paying some of your bills, taking care of things that help make your life easier, and just generally a nurturer. You can expect the full romantic experience with the Cancer man in love. He’s one that wants to make you feel like a million bucks because essentially you are making him feel this way. I mentioned a little bit that a Cancer man in love will want to take good care of you. He will also be very concerned with your safety. He wants you to feel as though he will always take care of you. He wants to be your protector and the one you turn to when you feel uncomfortable in your life in some way. Be aware that he will want you to let him know when you get to your location or home when you part from him. He may check in with you daily to make sure you’re doing well. This is his way of making sure that you’re safe and sound when you are not with him. When possible, he may insist on driving you to and from where you are going. It’s totally natural for him to want to be with you to ensure that he doesn’t have to worry about you as well. I’m not saying he’s going to be overbearing but he could be. If you find he is, you can simply tell him you need a little space. For the most part the Cancer man in love treasures you and your life when he’s in love and so he cannot bear for anything bad to happen to you. This makes his desire for your safety to be a bit high. His care for you is endless. If there is anything you need or need his help with, he will be there for you. He may do things like take your car to be serviced while you’re still sleeping so that you don’t have to when you need your car. If you decide to move in with him, you can bet he will always make sure that you have everything you need or even want. He’s the type of guy to pamper you because he wants you to feel like the queen that you are. When the Cancer man is in love, he tends to open up to his lady. He will tell you all his secrets, deepest desires, and his feelings about everything. He will share himself with you so that you fully get to know who he is. He wants you to know how much he loves you, why, and what the future holds between you. He’s not one to keep up a wall when he’s totally in love. He may be a little standoffish but only until he’s sure that you’re the one for him. Once he does decide that, he’s going to tell you anything and everything under the sun. The one thing that he may not share will be things that he will never tell anyone. This can make him seem secretive. If you trust him and love him though, you’ll understand that not every single detail has to be revealed to you. No one ever fully knows anyone 100%. We’re all humans and we withhold things that are intensely personal. That being said, he’s going to want to sweep you off your feet, take you home to meet his family, and hang out with his closest friends. He isn’t about hiding the woman he cherishes. Once you find yourself meeting those closest to his heart, you know that you’re in and that he’s the guy that you can rely on to love you. He will also want to get to know your family and close friends as they are seen a extended family. When a Cancer man opens his heart to you, he will definitely show you how much he is devoted to you and it will make you weak in the knees. He’s going to show you physical intimacy that you only dreamed of before. Cancer man is very sensual and in touch spiritually which means he knows what he’s doing with his love and his lover. Enjoy this special romance!